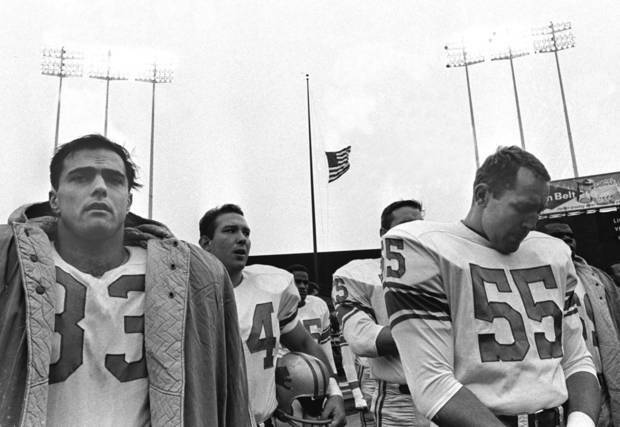 With the flag flying at half staff, Nick Pietrosante left, and Detroit teammates stand during a moment of silence before the start of a game in Minnesota the weekend JFK was killed. The car turned the corner as the motorcade wound through the streets of Dallas. Shots rang out…..and America would never be the same. It was, Pete Rozelle would later admit, the worst decision of his life. Allowing the NFL to play a full Sunday of games less than two days after the assassination of President John F. Kennedy on November 22, 1963, was the major blight on Rozelle’s otherwise glossy resume. Despite the pleas of many NFL owners, including Dallas Cowboys owner Clint Murchison Jr., Rozelle — citing JFK’s “avid love of sport” — determined that the games would go on. Kennedy’s press secretary and Rozelle’s college classmate at the University of San Francisco, Pierre Salinger, told Rozelle the president would have wanted the games played. “It has been traditional in sports for athletes to perform in times of great personal tragedy. Football was Mr. Kennedy’s game. He thrived on competition,” Rozelle said in a statement. And that Sunday, while the nation mourned its fallen leader, NFL games went on as scheduled in New York, Philadelphia, Pittsburgh, Cleveland, Milwaukee (Green Bay), Minnesota and Los Angeles. None were televised. “Worst mistake Rozelle ever made.” said Sam Huff, the Giants Hall of Fame linebacker. Players and fans pay their respects to the late President Kennedy in Cleveland. That Sunday, in Cleveland, where the Browns beat the Cowboys 27-17, Cleveland fans carried signs that pointed to the city of Dallas as having “killed the president.” The Cowboys fielded boos from a crowd angry over the assassination. The fledgling American Football League exercised better judgment. The AFL postponed all games and pushed the end of the season back to December 22. The First AFL game played after the assassination was on November 28, Thanksgiving Day. Rookie coach Al Davis led the Oakland Raiders to a 26-10 win over the Broncos in Denver. Bears players bow their heads prior to game against Pittsburgh in Chicago. Most college football games that weekend were either postponed or cancelled. Harvard, the President’s alma mater, and Yale were the first to announce they would not play. By Friday evening, all eastern schools had determined they would not take the field. Oklahoma and Nebraska decided to play for the Big Eight title and an Orange Bowl berth. The Cornhuskers won, 29-20. In Miami, school president King Stanford was ready to tell the waiting crown of 57,773 at the Orange Bowl that the game with Florida had been cancelled but was talked out of it by the university’s board of trustees. The Gators won 27-21. Although most contests in the NBA and NHL were postponed, in New York, both the Knicks and Rangers played at Madison Square Garden the weekend that America mourned. The Knicks beat Detroit 108-99 on Saturday; and the Rangers tied the Maple Leafs 3-3 on Sunday. NHL games were staged in Montreal and Toronto over the weekend as well. In addition to the Knicks, the St Louis Hawks and Cincinnati Royals split a home-and-home weekend series. The rest of the nine-team NBA — Celtics, Lakers, 76ers Warriors and Bullets — did not play on the weekend. Horse racing and harness racing were cancelled across the country. Personal: 50 years later, I vividly recall November 22, 1963. I was 12 years old, a seventh grader in Catholic elementary school in White Plains, New York, when we were informed of JFK’s death over the school PA system. The entire school was sent into church to pray for the President, then we were sent home early. Strangely, when I arrived home with my younger brother and sister, my mother was not in the house. The woman living across the street from us had gone into labor, and my mother took her to the hospital where she delivered a baby girl. That joyous occasion was the only bright light in a memorably tearful weekend, one where I saw my father cry for the first time. The previous weekend, my father took me to Yankee Stadium to see my first NFL game. The Giants beat the 49ers, 48-14. 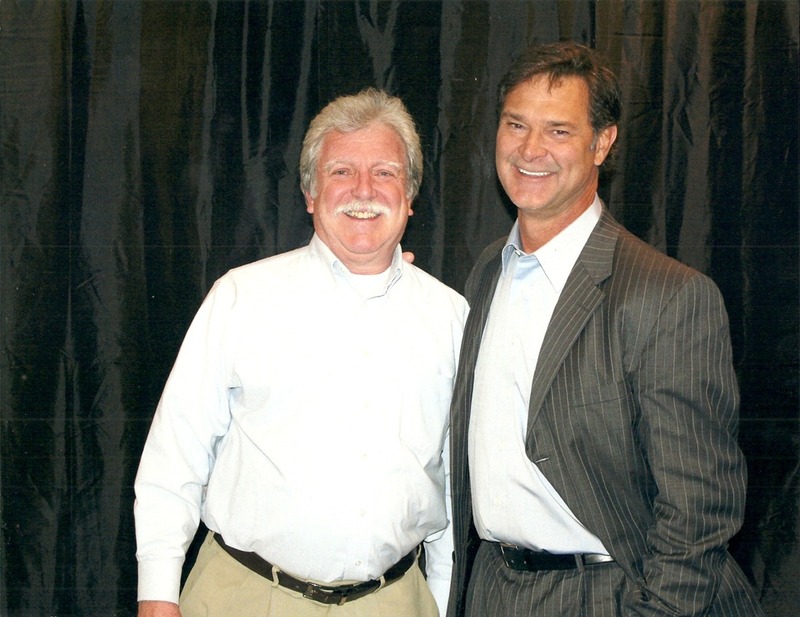 The SportsLifer and Don Mattingly, a couple of former players and current managers. Don Mattingly was on track for the Hall of Fame before back injuries took their toll and he was forced to retire prematurely at age 34 in 1995. Some argue he should have a plaque in Cooperstown. For four seasons, from 1984 to 1987, Don Mattingly was the best player in baseball. He won a batting title in 1984, an MVP in 1985, and led the American League in hits, doubles, slugging, OPS and total bases in 1986 when he batted a career high .352. In 1987, he set or equalled major league records by hitting six grand slams in a season and homering in eight consecutive games. All this from an excellent fielding first baseman who won nine Gold Gloves. As his back woes intensified, Mattingly’s numbers began to decline in 1988. In 1989 hit 23 homers and knocked in 113 runs — his last big offensive season. Like Mattingly, Puckett was forced to retire after the 1995 season due to eye problems. He had a higher batting average than Mattingly (.318 to .307), primarily attributable to his speed (Puckett stole 134 bases, Mattingly 14). Puckett also won a batting title and six Gold Gloves. Some more stats: Mattingly struck out 444 times; compared to 965 for Puckett, won an RBI title with 145 in 1985, and led the league in doubles three times. Puckett led the AL in hits four times, Mattingly twice. Puckett gained lots of visibility in the playoffs, especially in 1987 and 1991 when Minnesota won the World Series. Mattingly’s Yankees finally made the playoffs in his last year. Both were outstanding in post-season play. Mattingly hit .417 in his only appearance, while Puckett had a .309 average in four playoff series. Mattingly is now managing the Los Angeles Dodgers, who won the NL West and advanced to the NLCS before losing to the Cardinals. Perhaps success in the dugout could eventually earn Mattingly a Hall of Fame plaque — a Joe Torre story. Torre also won an MVP and batting title in his career — but he will get his Hall of Fame ticket punched on the four World Series he won for the Yankees starting in 1996. Ironically, that was the year after Mattingly retired. Owner James Dolan, perturbed by his team’s poor play, has shut down the Knicks City Dancers. Less dancing, more winning. Yeah right. Four games into the NBA season, and already panic has set in at Madison Square Garden. Coming off their best season in nearly 20 years, the Knicks have stumbled out of the gate, with inexcusable home losses to the T-Wolves and Bobcats. As always, the problems start at the top. MSG chairman James Dolan must be the only person in world who thinks the Knicks are a championship-caliber team. Get a clue Jimmy D. Carmelo Anthony may be a superstar, but he doesn’t make the guys around him better players. Amar’e Stoudemire may not be the worst player in the league, but he’s the most overpaid. And newly-acquired Andrea Bargnani is softer than the Pillsbury Doughboy. Losing Tyson Chandler, their best defensive player, to a broken leg isn’t helping matters. Dolan is so out of touch that he’s banned the Knicks City Dancers from performing some of their routines. As if that’s going to make a difference.